Arcadia Publishing (SC), 9780738544380, 128pp. 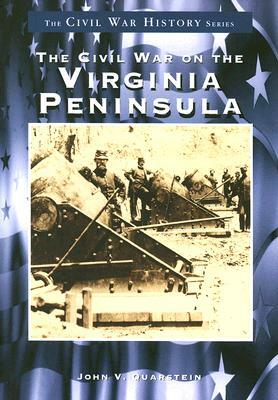 The Civil War on the Virginia Peninsula is the first comprehensive pictorial history interpreting the events that occurred on the Virginia Peninsula during the war that forever changed our nation. This volume offers over 200 fascinating images from museums, archives, and private collections throughout America; together they tell powerful stories of valor, leadership, technology, and strategy. Photographers and famous artists alike vividly portrayed soldiers, leaders, and innovations in a compelling manner that brings alive the glory and sadness of the American Civil War. This enthralling visual history chronicles the war's first year, during which the Virginia Peninsula was the focus of Union efforts to capture the Confederate capital 70 miles away at Richmond. Beginning with Union General Benjamin F. Butler's arrival at Fort Monroe in May 1861, until the time of Major General George B. McClellan's pivotal march on Richmond in the spring of 1862, the Virginia Peninsula was the scene of some of the Civil War's most critical events, including the "contraband of war" issue; the Battle of Big Bethel, the war's first land battle; the Monitor-Merrimac engagement, the first battle between ironclad ships; and the Peninsula Campaign.